Who doesn't love a transformation story?! Or a photo where people completely transform their bodies in a side by side shot. It's no wonder that "Transformation Tuesday" is such a big hit on Instagram and that so many people are drawn to any transformation. I think the ability to transform is one of the most amazing parts of the human journey. To know that what you are today, could completely change by tomorrow. It's clearly that hope of change that has people jumping on diet bandwagons, or buying the next insta-fix. But is there a way to guarantee a more sustainable form of change? To ensure that everyday you are just a little bit closer to where you want to be? I think so. But it has to start with where you are today. I remember 4 years ago at Thanksgiving, having just moved back to California. I saw my cousin coming back for a run before Thanksgiving dinner and she looked great & super toned and I was just so impressed with the discipline to be out there running- something I had done a grand total of 3 or 4 times while I lived in DC for almost 5 years. She had joined LA Roadrunners and signed up to run the LA Marathon. I knew right away that that was it. I had moved away from DC because I needed a change. My lifestyle over there was exhausting & it seemed like my metabolism had slowed down (how I could binge on pizza and wings all the time and never gain a pound is one of the life's greatest mysteries!) I just felt like running was part of the change that I was looking for. While waiting for Thanksgiving dinner, I impulsively signed up for the LA Marathon and then looked for a training group in San Diego. I found San Diego Track Club and signed up on the spot. The website said that I needed to be able to run for 20 minutes in order to be prepared for marathon training. And that was definitely something I was unable to do at that point. But I was committed. I went back home and worked up to being able to run 20 minutes at a time. 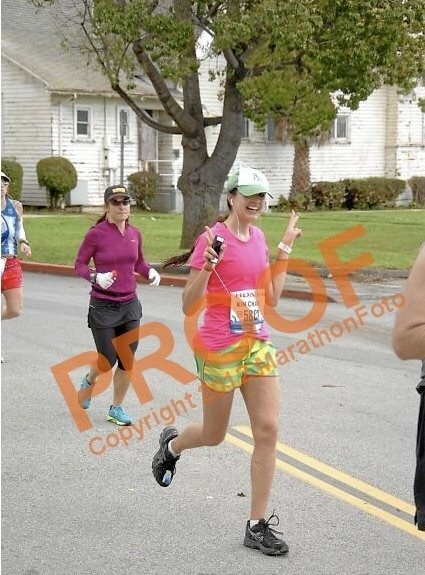 I started training with the track club and less than 3 months after not being able to run even 20 minutes alone and not working out for basically 10 years- I ran a 4:01 marathon in LA. That was all it took for me to stay consistent and want the transformation more. The transformation that running had on my life was NOT just a physical one. Committing to this lifestyle improved everything in my life- spirit, mind & body. I know that because of running, I processed through tough stuff that I had gone through, was able to reflect on God's faithfulness and choose gratitude, set goals & mentally challenge myself- and the obvious- get in shape. It took the catalyst of running & the desire to make some changes in my life to really transform my life in ways that I would never have expected. 1. Wherever you are, START THERE. The "before" picture in a transformation shot- usually isn't pretty- and it's supposed to look like that. You may have had some false starts that discourage you from ever even trying to start again. Or you feel like you need to be in a different place before you can REALLY start. But I'm here to encourage you, wherever you are today- THAT is the perfect place to begin. Don't wait for this or that to happen- tomorrow never comes- and you can't afford to delay your transformation- whatever it may be. 2. Find like-minded people. You cannot do it alone. If it's losing weight, starting an exercise regimen, picking up some type of hobby- whatever it is. YOU NEED PEOPLE. We were not made to go through this life alone. It's imperative to find people on your team to encourage you, challenge you, motivate you, speak life into you when you're discouraged. ALL OF THOSE THINGS. I've been into this running thing for 4 years now and I STILL need a support network. I am lost without it. Your mind is a crazy place- and it's easy to let self-doubt and negativity invade that fragile part of your brain where hope resides. The right people speak life back into those dreams you have and don't let you give in to those fears that will rob you of your transformation. I have these girls as my nutrition accountability. We aren't perfect but we focus on making better choices every day... We are logging everyday into MyFitnessPal.com in the hopes of making better nutrition choices (i.e. more veg, less sugar). You just can't do it alone & expect to win! 3. Start with the tangibles. Rome wasn't built in the day- & neither are your dreams. Dreaming is good, right? But too many people just wish and hope for things and don't have an action plan to make things happen. Ask yourself- what can I do today to get me closer to the dream? There are probably a million things I can be doing each & every day to make myself a better runner. But that's overwhelming and not feasible to do EVERYTHING all the time. What is feasible is picking a couple things each week to integrate into my life until they become just a part of my life& habitual. For example- starting to add turmeric in to my smoothies every morning, or rolling my legs out before I go to bed at night, or being vigilant about getting to bed early so I get good rest. All things that I previously didn't do, but have been making a point to focus on those things so that they are just a part of my life- and I can focus on the other things I need to start incorporating to get me closer to my goal- like doing running drills, or focusing on more plant-based nutrition on a daily basis. You don't get to from A to Z with just a wish & a prayer. You have to do SOMETHING. 4. Get your action plan together. So with that- put together a plan. You're the architect of your own life- but if you don't have the plans in place- who knows how that building is gonna turn out. ;-) Whatever the goal is- I like to put a plan in place to get me there. 5. Write those goals out- everywhere. Seeing your goals written out is just the visual affirmation that you need everyday. I spent some time working on a dream board with some friends that I will be writing out my goals for the year on and sticking up in a place where I'll see it daily as a constant reminder of my dreams. Big goals usually take a lot of sacrifice & hard work- so having something there to remind me WHY I'm doing this everyday really is motivating. 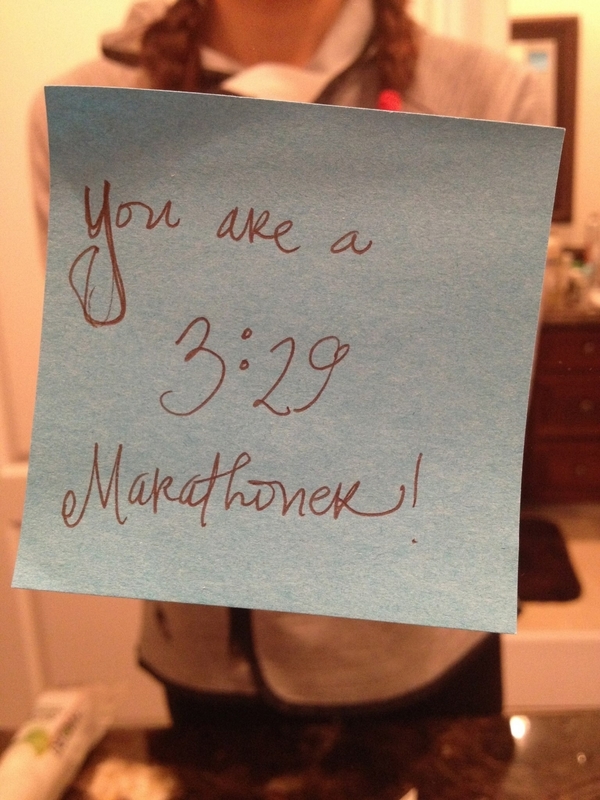 I had this up for the months before my goal race where I ran a 3:28:56... Probably not a coincidence!!! 6. Stay consistent. Don't give up because you have an off day… or two. You will never see the fruition of all your hard work if you give in to disappointment. This is another reason why it's great to have accountability in your life when the going gets rough. Life can get busy, you can get distracted or discouraged, but stay consistent in the day to day and you're going to see results. I have this quote up at my work as a reminder to stay consistent and faithful- and the results will be soon to come. 7. The actual goal is good- but the real change is usually your mind! To stay consistent when the results are slow-coming (or seemingly non-existent) is so good. It's such an exercise for life- when things with your job- or family may not seem to be giving you the results you want. Instead of giving up- persevere & trust the process. Hebrews 11:1 is one of my favorite verses- it says - Faith is the substance of things hoped for, the evidence of things unseen. Trusting that things are happening, even when you don't see them yet is the very definition of faith. And it sure does take a lot of faith to put the action out there to transform your life. ;-) Practicing on having faith & perseverance with your goals will pay off in every aspect of your life. I know so many people see other people's transformations and think - there is no way that could happen for me. That thought is basically the number one thing you can think to keep you the way you are. FOREVERRR. Gosh- even if transforming my body/mind/spirit takes the rest of my life, I'd rather go down that path. I'd encourage you to start where you are- wherever it is - and set a plan in motion- because you just never know what will happen. You deserve giving yourself all the chance for happiness & to see where the journey takes you. Like they say- if it doesn't challenge you, it won't change you.